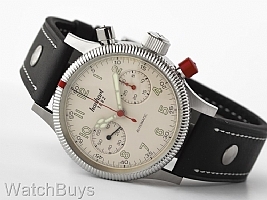 The Hanhart Pioneer MK II is based upon the design of Hanhart's first pilot's chronograph watch, first introduced in 1939. What is interesting about this watch is the placement of the chronograph pushers - they are asymmetrical rather than evenly spaced as on other chronograph watches. Hanhart has modified the movement to relocate the top pusher further from the crown, providing for ease of use. 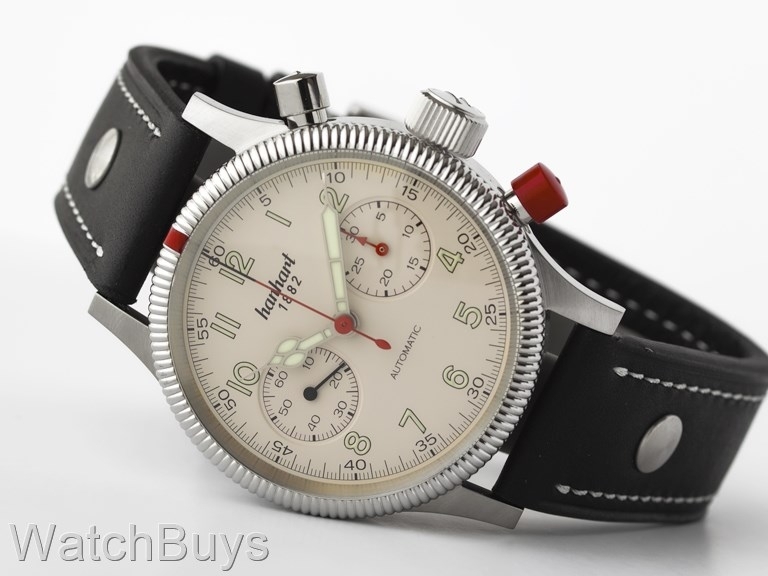 The red reset pusher is a Hanhart design and was developed as a warning mechanism to pilots using this chronograph in flight. This watch is classic Hanhart at its best. Verified Owner Comments: This is the second watch I have bought from Watchbuys, and their service is excellent. Very responsive. Delivered 4 days after ordering!